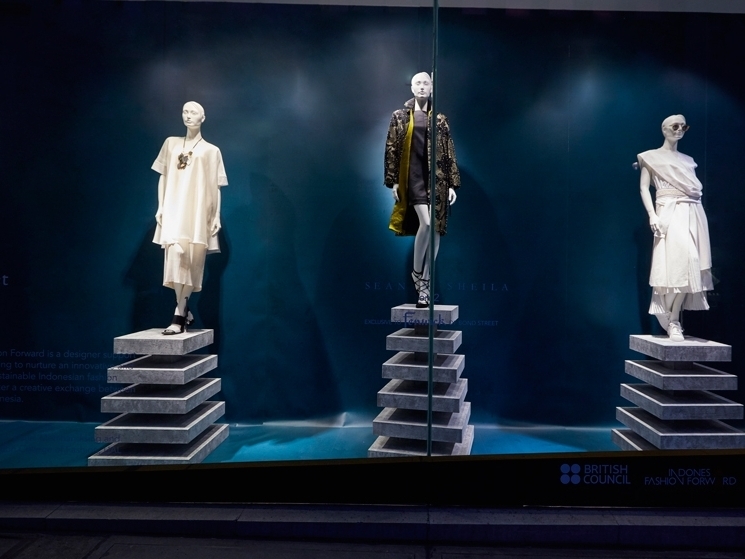 Working with Fenwick Bond Street, Propability brought vision to life when the London College of Fashion collaborated with Fenwick Department Stores for Indonesia Fashion Forward, a programme curated by the British Council. LCF’s students designed windows as part of Fenwick’s Indonesian designer pop-up shop and exhibition to celebrate Far-East fashion. The selected design for the collaboration was called Indonesian Architecture, an installation that presents the countries traditional and old roots with modern design. Propability manufactured five plinths made from MDF which were scenically painted to look like stone. Four to five tiers high and one at six tiers, the plinths were placed in the window as well as in store. Three of the plinths were placed on rotators to spin around in the window with the tallest measuring 1.2m tall and the small ones 0.5m tall. In addition, Propability handled the back wall texture which was printed on to PVC in 12 sections and the branded black and metallic gold window vinyl’s.